We testing with a machine on our office network (and also on ADSL lines) how our services would work just using just native IPv6. 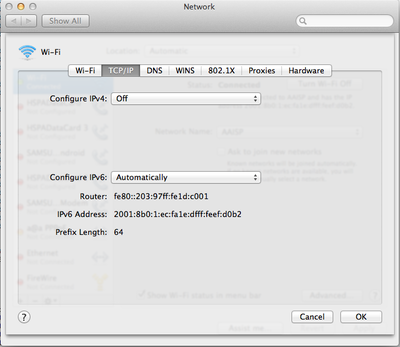 We used an apple laptop, and disabled IPv4 and enabled IPv6. -we suspect similar results on an ADSL line - we'll test this later on. We want to ensure that all our services work over IPv6. This page has our progress and notes. AAISP provide an IPv6 to IPv4 gateway, which allows one to connect to the IPv4 world from an IPv6-only machine. See IPv6 NAT64 gateway on the Knowledge Base. Each will return your corresponding IP address. If you get bored looking for IPv6 websites, there is always http://loopsofzen.co.uk to keep you occupied. This page was last modified on 5 November 2018, at 17:45.